What's not to love about a cut of meat with the word "tender" in it's name? Grilled beef tenderloin is right up there with my choices if I ever need to pick a last meal. If you have a special occasion coming up and want to impress your guest, this is the cut of meat you should splurge for at the butcher's shop. Some cuts of meat require work to get great taste and optimal tenderness. With the beef tenderloin, all the cook needs to do is not screw it up. The beef tenderloin is the cut of meat that provides us with the filet mignon. Just like the filet mignon, we want to keep the seasoning minimal and focus more on technique. Aside from over-seasoning, the easiest way to screw up a great beef tenderloin is to over-cook it! If there was ever a justification to purchase a good probe meat thermometer, this is it. You just paid a lot of money for this thing, what's another $40 for a good probe thermometer that will allow you to monitor the progress? Before we get into actually cooking this hunk of meat, we need to talk about trimming and preparing the tenderloin. If you can, I would suggest getting your butcher to trim the meat for you. You may pay more for it, but it will save you about 20 minutes of trimming time and also save you the trauma of removing so much waste from this expensive cut of meat. On the 6.5 lb. tenderloin I just prepared, I would estimate that I removed a pound of fat. That's a lot of waste and it hurts to throw that stuff away after spending so much on the tenderloin. 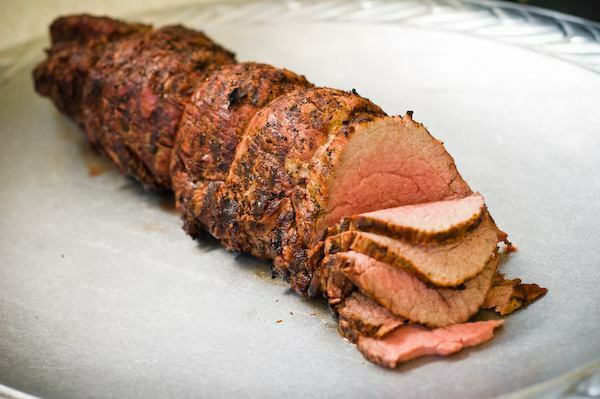 Entire articles have been written and some videos published on how to trim and prepare a tenderloin, so you can Google if you need more information. You are going to want to remove all of the fat and membrane (most will come off by pulling with your hands), the rubbery silver skin and the "chain", which is a fatty piece of meat that runs down one side of the tenderloin. 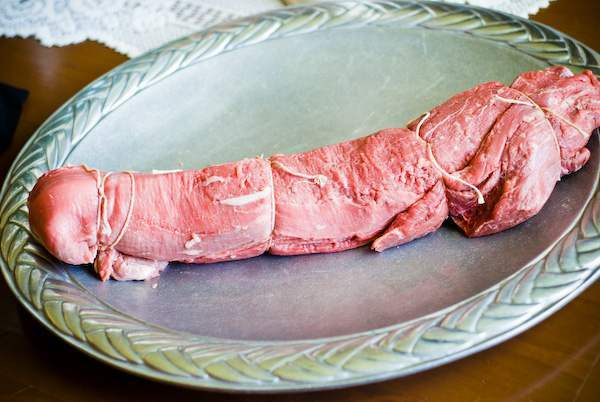 Once trimmed, fold a few inches of the thin end of the tenderloin over onto itself and secure with butcher's twine. Tie some twine around the tenderloin at about 2 inch intervals to hold the shape. Once the meat is trimmed and tied, you're ready to get started cooking! Update for 2017 - I used to prescribe to the “don’t add salt too early or it will pull moisture out of the meat”. After grilling many beef tenderloins and other cuts of meat, I think that is false. I prefer to add Kosher salt and fresh pepper to my beef tenderloin. If you don’t, people are going to be asking to pass the salt and that is just a sign you (as the chef) didn’t season your meat properly! 1Allow the tenderloin to come to room temperature on the kitchen counter. This step is really important, so don't skip it. If you don't let the tenderloin (or any large cut of meat) come to room temperature, it won't cook evenly. 2While your tenderloin is warming up, go ahead and light the grill. We are going to cook this indirectly, so pile up the coals on one of your charcoal grill or light half of the burners on your gas grill. 3For seasoning, less is definitely more here. I like to season mine with some fresh ground black pepper and Kosher salt. Rub the black pepper and salt all over. 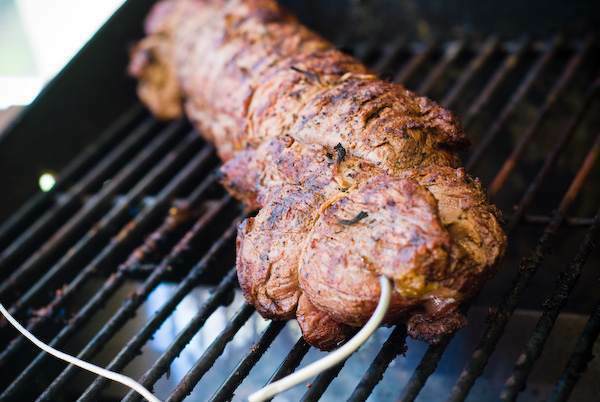 4Now that the beef tenderloin has warmed to room temperature and your grill is hot, place the tenderloin over the hot part of the grill to sear. We want to sear (not burn!) all sides of the tenderloin to create a nice crust. 5Once all sides are seared, insert your probe thermometer into the thickest part of the tenderloin and then move it over to the cool side of the grill. 6Close the lid and leave it alone! 7Maintain a grill temperature (on the cool side) of around 325 - 350. A 6 pound beef tenderloin should take a little over an hour to reach our magic temperature of 130 degrees. Don't go by time though, cook to temperature. 8Once the tenderloin hits 130 degrees, remove from the grill and place on a platter. 9Allow the tenderloin to rest under aluminum foil for 15 minutes before carving. Serious, let it sit! If you don't, all of those delicious juices will run out of the meat. 11Carve either thick filets, or for maximum tenderness, thin slices and serve! That's all there is to this great piece of meat. The hardest part is the prep and I would recommend you get the meat guys to do the work for you there. Grilling technique is the key here and with a good probe meat thermometer, there's nothing to it. I LOVE the Thermoworks ChefAlarm remote meat thermometer. It has multiple probes and is highly accurate, helping me create a perfectly grilled beef tenderloin. Beforehand I patted the meat on both sides with some olive oil and did the salt and pepper as described. Talk about mouthwatering, tender and tasty! Excellent advice on the ‘less is more’. 5 stars!